Pest description and crop damage This scale assumes many sizes, shapes, and colors. The typical form is almost hemispherical, shiny brown, smooth, and approximately 0.12 to 0.19 inch long. Eggs are oval and pearly white. The young vary from yellow to pale brown. Biology and life history Adult females may be found on leaves or bunches but mostly on shoots of current growth or on 1- to 3-year-old wood. Males have not been observed. Females lay eggs under their bodies. As the female dies, the body shrinks and an egg-filled pocket is formed. As more eggs are laid, the walls of the scale's body becomes hard and, after death, brittle. Young overwinter in a juvenile state on 1- to 3-year-old wood. They mature in late spring, when eggs are produced in great abundance. Hatching continues during early to midsummer. There is one brood per year. 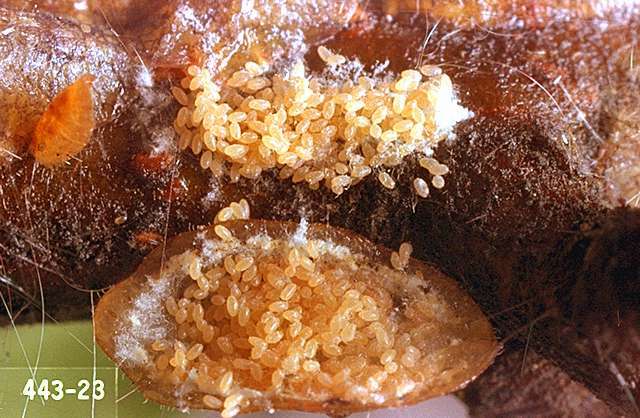 Although biological controls of European fruit lecanium scale have not been studied, parasitic wasps generally parasitize scale insects heavily. In the Yakima Valley, Metaphycus spp. is the dominant parasitoid. Since much of the vine is removed at pruning, it may be unnecessary to apply control measures unless the scale is infesting the main framework of the vine (main canes, cordons and trunk). horticultural oils-Some formulations OMRI-listed for organic use. pyrethrins-Some formulations OMRI-listed for organic use. horticultural oil (several brands)-Consult label for rate. Scales are controlled best in the dormant season. Apply spray at 200 to 300 gal/a with a hand or air carrier machine. 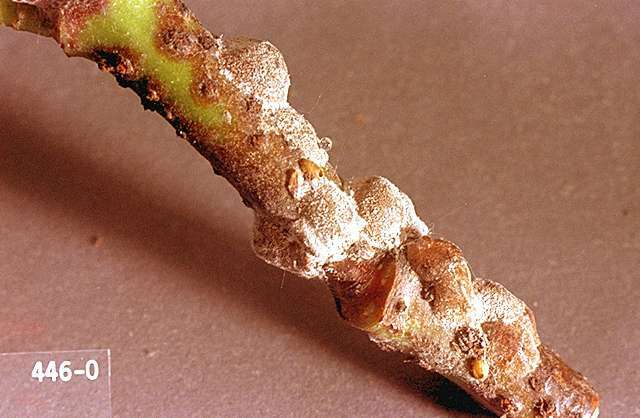 Sprays help control mealybugs. Do not apply dormant oil after buds start to open. Some formulations OMRI-listed for organic use. Soil application at 0.25 to 0.5 lb ai/a. PHI 30 days. Apply in one or two drip irrigations between budbreak and pea size stage of berry development. Consult label for restrictions. Do not apply more than 0.5 lb ai/a per year. Group 4A insecticide. Foliar application at 0.036 to 0.05 lb ai/a. PHI 0 days. 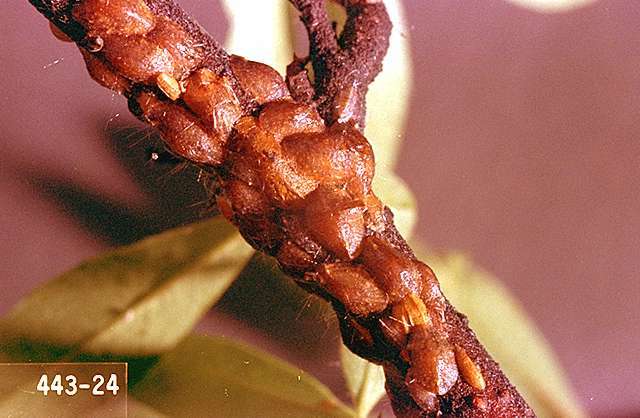 Although scale insect is not listed under foliar applications for grape, it is a legal use and should be helpful in controlling scale crawlers. Do not exceed 0.1 lb ai/a per year. Allow 14 days between applications. Group 4A insecticide. spirotetramat (Movento) at 0.10 to 0.13 lb ai/a. PHI 7 days. Ensure that there is adequate foliage for absorption of the compound. Allow 30 days between applications. Do not exceed 0.2 lb ai/a per season. Use a high quality spreader to enhance penetration into foliage; see label for details on which adjuvants to use or avoid. Group 23 insecticide.